I've been playing with the violin for a while now. The latest song I learned was He's a Pirate from Pirates of the Caribbean. 'cuz it is a lot of fun. I want to make a video of me playing it. And it works. However, this song has many instruments other than the violin, so it is a bit boring to just listen to me playing the violin. So I wanted to append to my video the actual soundtrack. The problem is, of course, that the soundtrack includes violins. And it makes no sense to have me playing the violin because the soundtrack already does it. So essentially, I need the He's a pirate soundtrack, without the violin part so that I can play such part by my own while enjoying the other instruments match my notes. This isn't just about He's a Pirate. I probably will want to achieve the same effect for a lot of other songs, and I have no idea where/how can I get soundtracks missing specific instruments. If you explore some YouTube videos, well, you'll notice that many performers already seem to do this: Grab a popular soundtrack which is somehow missing the violin part (I think), play it in the background, and then play by themselves with their violins. Is there some kind of resource or perhaps software to get this file type? There are a number of companies that provide recorded audio tracks of popular music of all sorts, from classical to jazz and pop music -- with the solo instrument or lead vocal part missing from the recording, so that you can play this part yourself with the recording as an accompaniment. Foremost among these companies is Music Minus One in the US, which has been in business since 1950. Today Music Minus One sells their own accompaniment tracks as well as those by other companies including the giant music publishing company Hal Leonard. Everything that they sell is fully licensed and legal for the uses that are specificied. At MusicMinusOne.com, and elsewhere, you can find a huge variety of accompaniment tracks for solo instrumentalists of all types, as well as singers. Most come in a package with sheet music. Depending on the nature of the copyright on the material, and the license you purchase, you may or may not be able to use these recordings to make your own commercial recording. There are solo musicians who use these recordings to accompany themselves in live performance, too. In the early 1990s there were several commercial companies that licensed the rights to a lot of pop songs and made and sold libraries of Standard MIDI File sequencer data, which contained note-for-note recreations of the arrangements of hit pop songs played and programmed by keyboardists on MIDI controllers. The libraries were sold on floppy disks. Unfortunately this was a fad that did not last. Most of those companies went out of business, and their rights to use those copyrighted songs in the products they sold were for a limited time and expired. However, you can find lots of Standard MIDI files of pop songs on the Internet. You can play a Standard MIDI File in Windows or the Mac OS using their built-in (very crude) General MIDI sound libraries. You can also import a Standard MIDI file into many sequencer programs, DAWs, and music notation programs like Finale or Sibelius, for playback using their General MIDI sound libraries. Once you have the MIDI data in a sequencer, you can edit things to provide better sounds from the software virtual instruments you work with. If you have a full arrangement of a song as a Standard MIDI sequence, obviously you can mute the tracks of the instruments you don't want and you can play along with them yourself and make your own recordings. I should also mention this surprisingly rich resource for Standard MIDI files of classical music in the public domain which is free, based on the contributions of enthusiasts. It has everything from piano works to full orchestral scores. The quality of the MIDI sequences varies depending on the creator. The SmartMusic company makes a music education software and hardware product for learning to play an instrument (or to sing). They sell a large library of pre-programmed accompaniments, and the system actually listens to the playing of the student and adjusts the tempo and phrasing to match the student's playing. Their catalog of material leans heavily on the standards of classical and jazz music taught to intermediate students in schools. They have partnered with the Jamie Abersold company to provide its jazz accompaniment tracks formatted to work with the SmartMusic interactive system. SmartMusic is owned by the same company that owns the Finale music notation app. 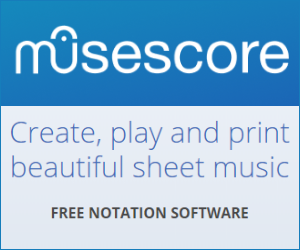 Apparently you can create your own custom scores in Finale and export them for use in the SmartMusic system; I do not know the details. The Jamie Abersold company has a large library of recorded backing tracks for learning jazz soloing and accompaniment. Their system is well-regarded among jazz educators. Their website is jazzbooks.com. And as mentioned above, some of their products are also sold through Music Minus One and SmartMusic. Yamaha makes the Disklavier line of acoustic player pianos, which get the music from MIDI data. Accordingly, Yamaha sells libraries of piano songs which are MIDI sequences in Disklavier format. I believe some of them also have orchestral accompaniments which can be used with a Yamaha acoustic piano which has the Disklavier player system as well as a General MIDI sound module built-in. This is a specialized application, but there is a lot of music available for this system. Commercial Auto-accompaniment software for jazz musicians. These programs enable one to construct a song arrangement and chord progression, select various instruments, select a specific musical style with specific parameters, and then the program can generate an algorithmically-created accompaniment ensemble, usually played back through a General MIDI virtual instrument and/or with loops of performance by live musicians. You can save the output as an audio file, or export a Standard MIDI file for further work in a music notation or sequencer or DAW application. The user community for both of these programs have made thousands of song files of popular jazz standards available for use with the programs -- many free, some sold in sets. The song files generally are based on the chord progression only, and do not include a melody, lyrics or lead instruments, thus avoiding copyright challenges. Not the answer you're looking for? Browse other questions tagged software performing accompaniment or ask your own question. How can I get the instrumentals for a song? How do I mute the guitar in a song so I can play with the backing track? How can you assign a single track to multiple outputs on Cubase 5? What software can change guitar backing track one-half step lower?